I've been working on this on and off while having nothing better to do for a week or so, probably spent about an hour or so on it. It's a 8-bit sounding template for fl, i listened to a few 8 bit songs and tried to get my sounds to match their sounds. It has a few example songs in it..
You are a genius--- I am still learning FL Studio and find all the knobs, dials and switches more overwhelming than it should be. Thanks!! Can you record onto FL Studio? Like if I plugged a guitar into a mixer and then into the computer, would it actually record on here? If it does I might look into getting it when I get a new computer for my 18th on Sunday. Otherwise, I'll probably just dig out an old copy of Cubase and stick that on. 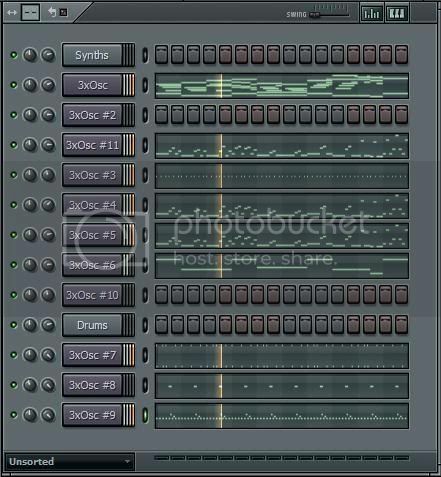 Quote: "You are a genius"
Quote: "Can you record onto FL Studio?" Haven't used it in a while. I'll download the demo of FL Studio and have a little comparison. FL Studio supports recording but I hear you need an ASIO sound card to do so. Quote: "I hear you need an ASIO sound card to do so."